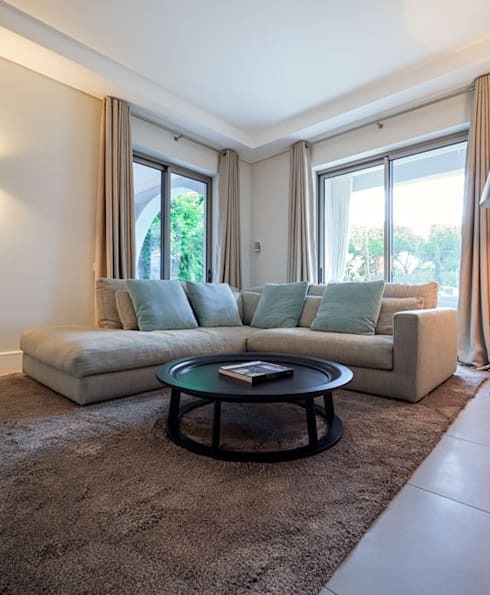 Today, we're taking a look at a villa in Quinta do Lago, in Portugal's Algarve, whose interior has been carefully decorated by interiors outfitters Refelxões Contemporary Design. Refelxões is an interesting company – not only does it design interiors, it also sells the furniture and fittings that will go into those interiors. They stock a vast range of designer furniture and lighting from famous names such as Flexform, Vitra, Gervasoni, Meridiani, Rimadesio, Paola Lenti, Varenna Kitchens and Agape Bathrooms. The company's specialty is contemporary furniture and 20th century design classics, and it's fascinating to observe how this furniture fits beautifully into the traditional villa style of this house to create a space that's cool and modern, yet totally luxurious. 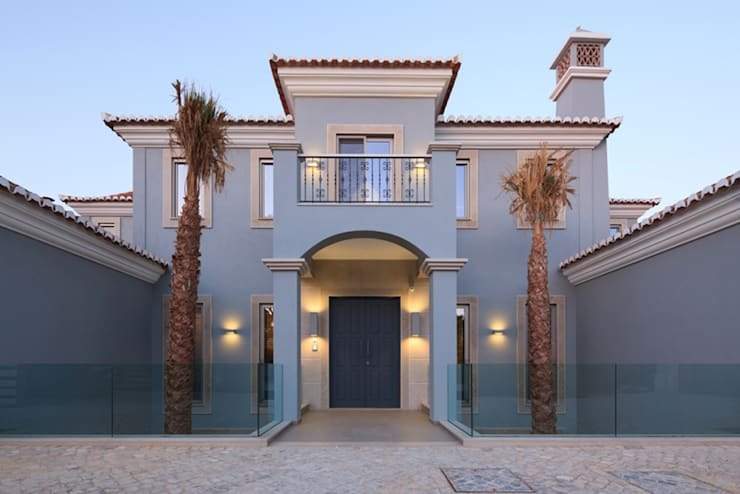 The villa's facade is imposing and traditional, but has been given a modern update with all-glass railings to the right and left of the door. This hints at the contemporary interior to come. 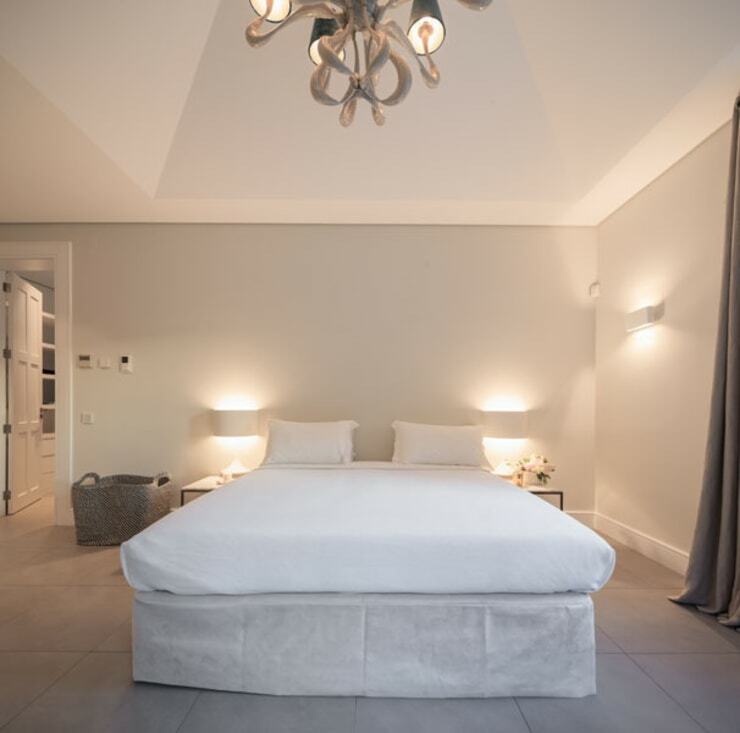 The key aspect of the villa's interior is a combination of elegance and restraint. 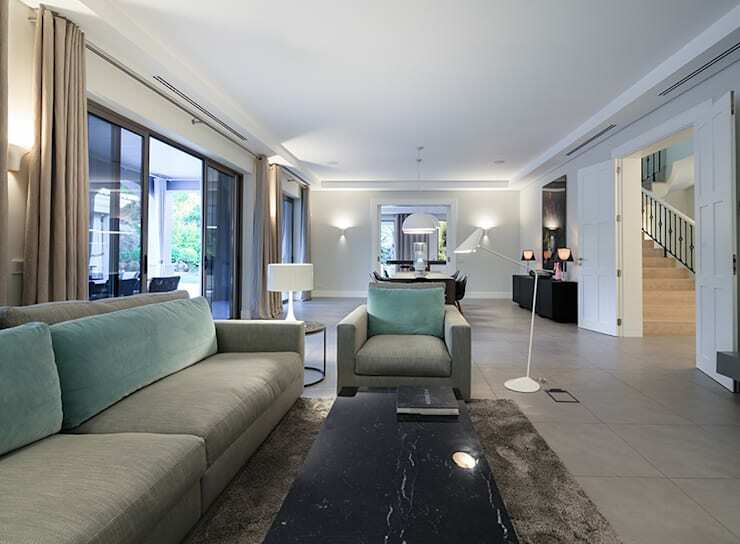 The colour scheme throughout is muted, with the sense of luxury coming from rich textures and luxury materials. Here we see a sober sky-blue adding some gentle colour to the living area, the only colour in an otherwise neutral space. A black marble coffee table is both luxurious and imposing and contrasts wonderfully with the white table lamps and reading lamps. In another corner of the living room is a lounging space, with a softer sofa that's part chaise longue. Here, the coffee table is less imposing and more geared toward relaxation. This relaxation zone is delimited by a plush rug that's cosier underfoot than the ceramic tiles that make up the rest of the floor covering. The dining area sits beyond the living space and here again we see texture being put to work to give depth and luxuriousness to the neutral colour scheme. Chocolate brown suede chairs are soft and inviting, and a matte finish on the table top seems extra-soft in contrast to the ceramic tile on the floor. The theme of contrasts is followed through in the two white pendant lamps hanging over the dining table. A touch of colour comes from the painting of a vase of flowers on the wall – but those colours are dark; only the merest hint. Nothing in this room is loud or bright; everything has been chosen to create a quiet and refined atmosphere. Another serene, clean and contemporary room, punctuated only by that stunning pendant lamp hanging from the double-height ceiling. This could be the bedroom in a modern loft in Berlin, rather than a sumptuous villa in Portugal. The only clue we have that we are in the Algarve is those ceramic tiles on the floor. 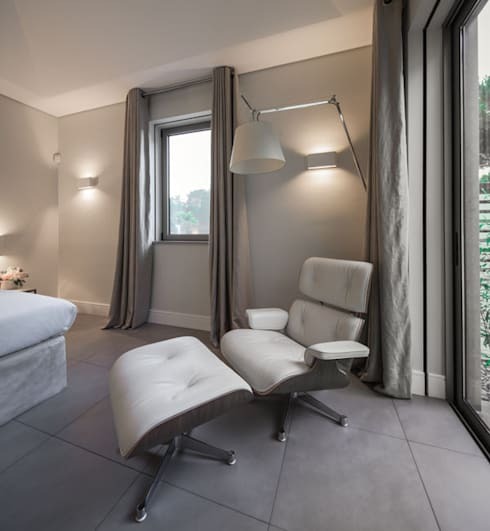 In one corner of this bedroom sits an Eames armchair, and again we see the clever use of texture rather than colour to create visual interest. Covered in softest white leather, it stands out against both the grey floor tiles and the soft grey of the walls. A reading lamp overhead effectively creates a cosy yet very elegant reading nook. The first real pop of colour we've seen comes thanks to these fabulous burnt orange leather lounge chairs. This living area/closet space is just off the bathroom, and incidentally, is the dividing space between it and the bedroom. The fireplace here is double-fronted, meaning it's visible both from this ante-room and from the bathroom. 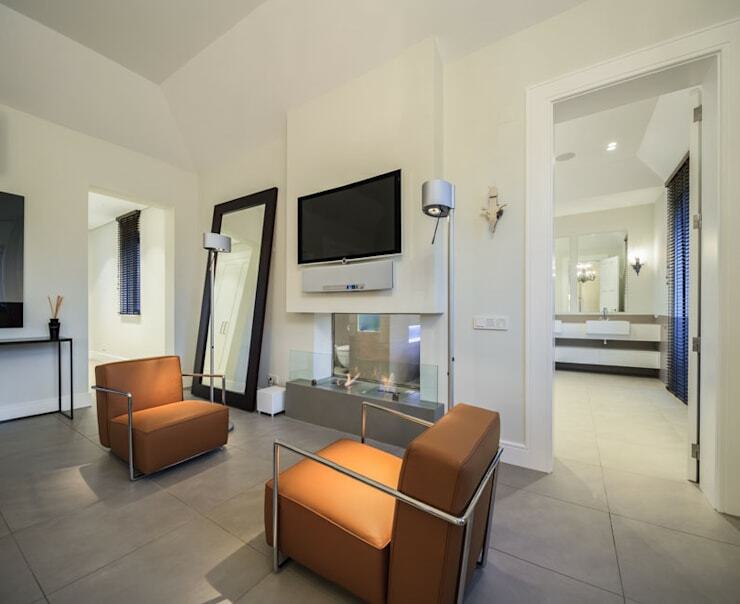 You know you're in the company of serious luxury when not only does the master bathroom have an anteroom, but also a television and a fireplace! That said, the key here, as through the rest of the house, is restraint – yes, this is serious luxury, but it's telegraphed quietly. This bath sits just beyond the fireplace visible in the previous photo. 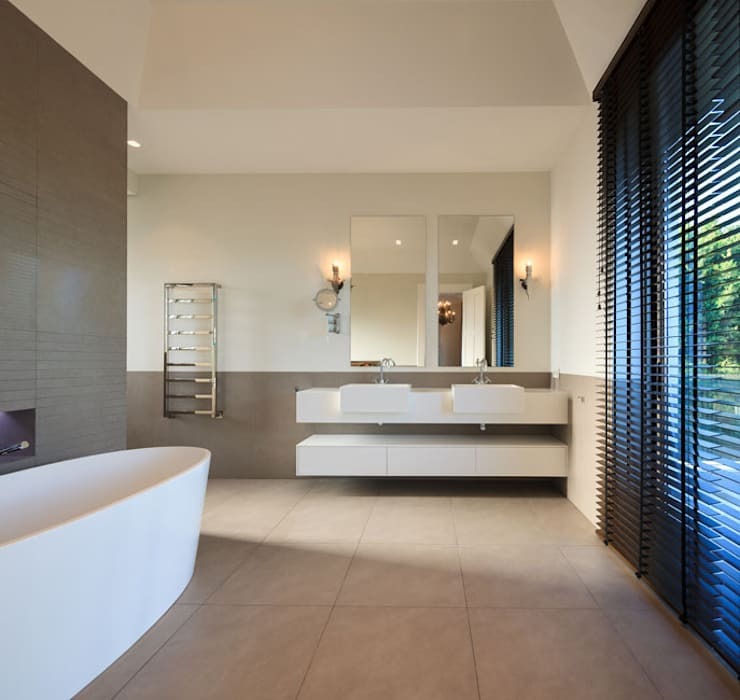 Again, it's a simple room that relies on textural contrast for interest – in this instance, that comes from the slatted blinds covering the full-length sliding doors. Outside, things are a little more obviously luxe, particularly within this poolside tent. The curtains are weather and waterproof, meaning that this space could also be used in winter with the curtains closed. The colour scheme is again neutral, with just a tiny deviation in the dusky rose pendant lamps, whose ruched texture provides a nice contrast to the smooth fabric covering the couches. 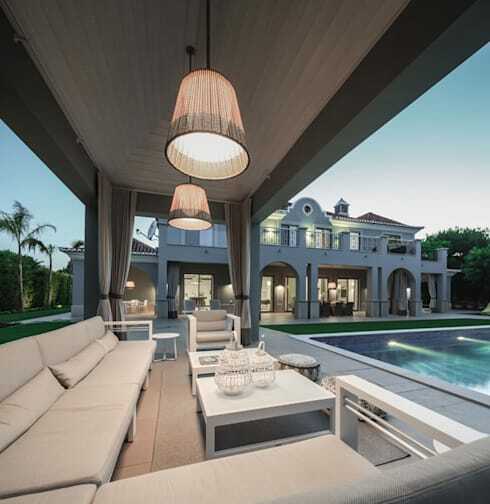 Do you like this villa's restrained luxury? Let us know in the comments!